Our proclamation: Valentine’s day is (un)officially for Vegans. Vegan lovers AND the vegan-curious can sit it with us on Valentine’s Day as we continue our foodie expedition during Vegan Restaurant Week in Baltimore. No plus-one required. We'll venture to another lo-conic establishment, Hampden’s casually cool and always top of the “best” lists, Golden West Café - where Baltimore goes for comfort food. Don’t stay in on Valentine's eve (also frequently referred to as February 14th) if you’re flying solo. This'll do your heart good, literally. It’s the #yearofthevegan according to The Economist. There’s still time to make and easily fulfill one resolution. Getting healthy is always at the top of the list. It starts with food. 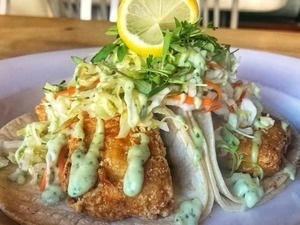 Maryland Vegan Eats, the organizers behind Baltimore Vegan Restaurant Week is offering a gateway, if you haven’t already experimented with or adopted a plant-based diet. We’re also celebrating the 2nd anniversary of Mixolo’s launch in Baltimore! Then the party was virtual, now it’s in real life (IRL). First drink’s on Mixolo and there's a sweet dessert surprise for all! If you’re a brave heart, and you want to keep the night going after our meal, plan to hang out for the cheeky musings of Baltimore queen of horror, Aurora Borealis, in her ghoulish Shocktail Hour. So Baltimore! Fun trivia, prizes, and a few surprises. Samantha Junegul, owner of Golden West Café, is thrilled to be part of Mixolo’s solo-friendly movement. She wants to seat you now in their eclectic and inviting dining room. Golden West Café was one of the pioneers of a special Vegan week in Baltimore and are well known for their amazing “fish” vegan tacos, Oreo cookie pancakes (yes, Oreo) and Vegan Tofu Banh Mi (with or without the baguette). Nestled comfortably and holding their spot on Hampden’s Foodie Avenue, Golden West Café is heralded for their exciting American and New Mexican cuisine for all of the food ‘isms, - and they’re open all day until midnight! All restaurants are invited to participate in Vegan Restaurant Week, even if they are not vegan. Offering vegan items on the menu makes sense. The benefits of a plant-based diet are not only for the animals. There is no science that has linked a wholesome vegan diet to disease. Your ticket price is a minimum payment for the event and will be credited against you’re a la carte order from Golden West Cafe's extensive menu (link). You will be responsible for charges above that amount. Mixolo will cover your first drink (for a toast of, course) and a special dessert surprise to show you how much we heart you for coming out with us! Golden does not normally require reservations or pre-payment, however, Mixolo must make pre-arrangements with our hosts to reserve seats and honor our reservations, so we will not process refunds. We’ll be reserving your seat at our community table. Events cancelled by Mixolo or our hosts are fully refundable. If plans change, please let us know as soon as possible. Hampden offers paid on-street parking, limited Valet parking on the same block as Golden West as well as free, limited residential area parking. February 14 will likely be a busy evening. Consider ride-share for a worry-free evening. Celebrate your way. Golden West Café has no stuffy rules about dress. Photos may be taken for promotional purposes for our web, social media and marketing materials. Mixolo is a real-life social network; we want to minimize the use of stock photos and reflect the true essence of our MIxolo community. Your registration and attendance will imply your willingness to participate and your release of all photos for use in marketing and promotions for Mixolo, Inc.
Our events are now offered for purchase in the Mixolo mobile app available on Google Play or Apple iTunes for download. The use of MIXCHAT, our messaging platform for connecting with members after you meet at an event is currently available only with purchases that originate in the app.